As you can see it in the first Wireshark tutorials, it is extremely easy to install and start Wireshark to analyze the network. A very common problem when you launch Wireshark with the default settings is that you will get too much information on the screen and thus will not find the information you are looking for. Too much information kills the information. That's why filters are so important, they will help us to target, in the prolific logs, the data you are looking for. Display filters: Used to search inside the captured logs. They can be modified while data is captured. So should I use the capture or the display filter? The goals of the two filters are different. The capture filter is used as a first large filter to limit the size of captured data to avoid generating a log too big. The display filter is much more powerful (and complex); it will permit you to search exactly the data you want. The capture filter syntax is the same as the one used by programs using the Lipcap (Linux) or Winpcap (Windows) library like the famous TCPdump. The capture filter must be set before launching the Wiershark capture, which is not the case for the display filters that can be modified at any time during the capture. - Fill the "capture filter" field or click on the "capture filter" button to give a name to your filter to reuse it for subsequent captures. - Click on Start to capture data. Displays packets with destination TCP port 3128. Displays packets with source IP address equals to 10.1.1.1. Displays packets with source or destination IP address equals to 10.1.1.1. Displays packets with source UDP or TCP ports in the 2000-2500 range. Displays packets with source IP address equals to 10.7.2.12 and in the same time not with the destination IP network 10.200.0.0/16. Displays packets with source IP address 10.4.1.12 or source network 10.6.0.0/16, the result is then concatenated with packets having destination TCP portrange from 200 to 10000 and destination IP network 10.0.0.0/8. The backslash "\" sign is used when a keyword is used as a value. "ether proto \ip" (is equivalent to "ip"). This will target IP protocols. "ip proto \icmp" (is equivalent to "icmp"). This will target icmp pakets typically used by the ping utility. 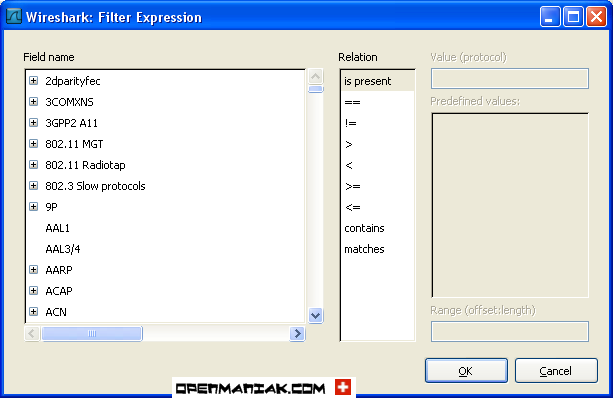 The "multicast" and "broadcast" keywords can also be used after "ip" or "ether". "no broadcast" is useful when you want to exclude broadcast requests. Check the TCPdump man page for information about the capture filters syntax. 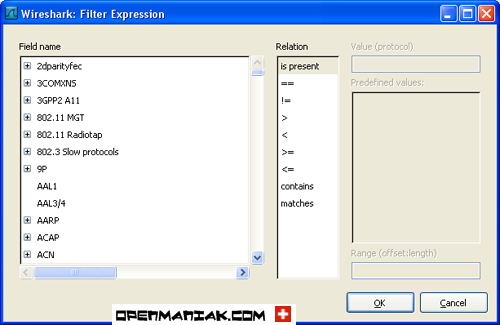 Other capture filters examples can be found in the Wiki Wireshark website. The display filter is used to search inside captured data obtained with a capture filter. Its search capabilities are more extended than those of the capture filter and it is not necessary to restart the capture when you need to change your filter. A large number of protocols, located between layers two and seven of the OSI model, is available. They can be seen when you click on the "Expression..." button in the main screen. The Wireshark website provides explanations about protocols and their sub categories. Sub protocol categories inside the protocol. To find them, look for a protocol and then click on the "+" character. The logical "XOR" expression, well known by programmers, is used as an exclusive alternation. When used between two conditions in a filter, the result will be printed on the screen only if one of the two conditions is fulfilled but not both like for the "OR" expression. Only packets with TCP destination port 80 or TCP source port 1025 (but not both!) will be displayed on the screen as the result. snmp || dns || icmp Display the SNMP or DNS or ICMP traffics. Displays the packets with source or destination IP address equals to 10.1.1.1. Displays the packets with a source IP address different from 10.1.2.3 or with a destination IP different from 10.4.5.6.
tcp.port == 25 Display packets with TCP source or destination port 25.
tcp.dstport == 25 Display packets with TCP destination port 25.
tcp.flags.syn == 0x02 Display packets with a TCP SYN flag. If the filter syntax is correct, it will be highlighted in green, otherwise if there is a syntax mistake it will be highlighted in red. 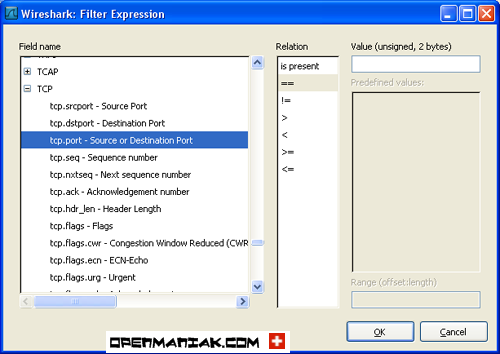 Supplementary information about the display filters can be found on the Wireshark official website or on the Wiki Wireshark website.